The Division 2 Nemesis is the latest in the growing list of Division 2 Exotics, and this one is an Exotic Sniper. 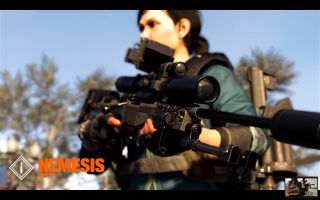 Division 2 Nemesis was added to the game as part of the recent Tidal Basin update and the method of acquiring this Division 2 Exotic Sniper is somewhat different to the rest of the rare guns available in The Division 2. If you want to get your hands on the Division 2 Exotic Sniper Nemesis - also known as an Exotic Marksman Rifle - read on for our Division 2 Nemesis guide. Unfortunately at the time of writing, we don't know the exact stats for the Division 2 Exotic Sniper yet. We'll get on the reasoning in a moment, because technically the gun is available in-game, it's just super hard to acquire right now. We'll update this as soon as we can get our hands on Nemesis but for now, read on for the guide on how to get Division 2 Nemesis. Obtaining the Division 2 Exotic Sniper is a multi-stage process. First off, you have to progress your game to World Tier 4, then take on the Tidal Basin stronghold. Play all the way through in story mode until you reach the end, and you should progress to World Tier 5. Next, take on the three new Invaded missions that unlock the Capitol Building stronghold again, and play through that. This will give you access to Tidal Basin again, but this time you can select which difficulty you play on. Pick your preferred difficulty - we'd recommend normal so you can get through it quicker - then play up until the section right after you destroy the first set of defences. Manny Ortega will tell you to patch ISAC into a laptop. Go upstairs in that building and on one of the bunkbeds, there should be a Black Tusk Keycard to pick up. Continue playing through the mission until you reach the hovercraft cargo bay. Fight to the back of the hovercraft and when you're instructed to take a right turn and go through a door, go left instead and you'll find a door locked with a keypad. Interact with it and the Black Tusk Keycard will be consumed. Go inside and you'll find a weapon crate containing the Adrestia SR-1 high-end marksman rifle. It might feel wrong to dismantle a named weapon, but you need to deconstruct the Adrestia SR-1 to obtain an exotic component: Marksman Rifle: Scope - The Tally. If you take a look at the inscription on the component, it mentions three other names; Klutz, Shorty, and Prime. To obtain the other parts for the Nemesis, you need to kill these three people. Each one is a named Black Tusk boss at the end of the three invaded strongholds. Do you see where this is going? Head back to the invaded Capitol Building stronghold and play through it again. At the end, you'll fight Prime. He should drop the Marksman Rifle: Barrel - The Scourge. It's unconfirmed whether this is a random drop or not, so if it is, you'll need to run through the invaded version of the stronghold until it drops. Right now, those are the only two parts of the weapon that should be available. With that said, players have found a workaround to obtain the other two parts, but it requires you to have a friend who is only World Tier 1 and hasn't done any of the invaded strongholds for the first time. To obtain the Marksman Rifle: Bolt, you need to kill Shorty at the end of the invaded Roosevelt Island stronghold. For the Marksman Rifle: Stock - The Bridle, you need to kill Klutz in the invaded District Union Arena stronghold. That sounds easy, but the caveat is that you can't run through these invaded strongholds right now. As of the latest update, the invaded strongholds and missions are on a weekly rotation. So you'll need to wait until they're available since you can't toggle the invaded status on those strongholds like you can for some missions. Now there's one workaround that may result in being able to obtain Nemesis early, but it requires you to have a friend - or an alternate account - who is World Tier 1 and hasn't completed any of the invaded strongholds yet. If you jump in their game and complete the respective invaded strongholds, there's a chance that both Klutz and Shorty could drop the required parts. This is unconfirmed - one Reddit user said they managed to get one component but not the other through this method. Nevertheless, if you've got a pal who isn't as far through the game yet, jump in with them and see if you can get the parts to drop. Remember that to get any of the parts, you need to deconstruct the Adrestia SR-1 first. There's no confirmation as to whether you also need a Nemesis blueprint to craft the Exotic Sniper, but as soon as we get our hands on the gun and have more definite information we'll update this guide. Until then, have fun killing a lot of Black Tusk! Need more Division 2 in your life? Check out the latest Division 2 patch notes.